When Sam Fuller’s film White Dog, a two fisted salvo against indoctrinated racism, began its limited released in 1982, it had already been guaranteed its commercial failure. As the film was nearing completion, word was getting out to the press that the film contained racist material; all the while the NAACP began threatening the inclusion of White Dog into their already planned, labor-related boycott of Paramount (the film’s production company). This kind of attention to one of his projects must have broken Fuller’s heart. If anybody involved would have taken the time to notice, they would have seen that throughout his entire career Fuller had used his movies to fight against racism. From the sight of an integrated platoon in The Steel Helmet to the African-American psych-ward patient who, driven mad by racism, thinks himself a Ku Kluxer in Shock Corridor, Fuller made his view on the subject very clear- racism was a disease, more specifically it was an American disease that passed from person to person not by heredity but by inculcation and intimidation. The film White Dog was adapted from the biographical/fictional novel by Romain Gary about a stray German shepherd that he and his then wife, Jean Seberg, took in during the late sixties. They begin to realize that this dog, which they name Batka, is trained to attack African-Americans. Gary and Seberg decide to take the dog to an animal trainer for re-education but by the end of the book an African-American animal trainer, whose sympathy lies with the then prevalent black power movement, reprograms the dog to attack whites. This is where Fuller broke away from Gary’s book as he perceived the ending to be racist. Fuller viewed racism as racism, and the results would be the same no matter who was using it- madness and chaos. In the film, Kristy McNichol plays the Jean Seberg stand-in, Julie Sawyer. After accidently hitting a white German shepherd on the road, Julie takes the dog into her home so she can nurse it back to heath while trying to find the dog’s original owners. While caring for the dog, Julie and her boyfriend Roland Grale (Jamison Parker playing the Romain Gary stand-in) begin to see habits in the dog that lead them to believe that it was trained as an attack dog. Julie, not wanting to put the dog down, takes it to an animal training ground, run by a trainer named Carruthers (Burl Ives), to deprogram the dog of its training. As Julie and Carruthers are talking, another of the ground’s trainers, an African-American by the name of Joe (Bob Minor), approaches and is instantly attacked by the dog. Carruthers, having dealt with this situation before, realizes that this dog is a “white dog”, a dog trained to attack black skin. Carruthers wants nothing to do with this dog but in the background watching is another African-American trainer named Keys, the main protagonist of the film played by Paul Winfield (who, just ten years earlier was in a very different film about a dog, Martin Ritt’s Sounder). Keys has a hypothesis that a dog once trained with racist hate can be untrained. He has tried to deprogram a white dog twice before but has failed. He now sees a new opportunity with Julie’s dog and spends the rest of the movie in psychological battle with the animal’s warped mind. Samuel Fuller has rarely told a story subtly. The tools of his trade have always been the emotional directness of heightened melodrama, the bombastic use of visual metaphor and the art of a gut-punching hook line. He learned all of these tricks-of-the-trades from his days pounding the pavement as a yellow journalist. 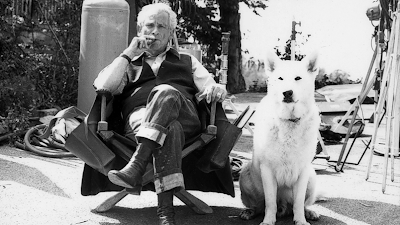 It is with this in mind that we can appreciate White Dog as Sam Fuller at his agitprop best. In one scene a character will spout, in full earnestness, “You’ve got a four-legged time bomb!” while in another, tension is built as a young African-American boy, innocently eating an ice cream cone, goes back inside a building, as we the audience see him barely escape the roaming gaze of the dog on the prowl. All of this could be seen as tawdry exploitation if it were not for the justified rage fueling the narrative of the film. Fuller had a belief in common sense, that ability a person has to choose the most justified course of action by weighing all of the presented facts and the points of view by those involved. To him it was common sense that racism was the festering disease at the heart of the American dream and it was time again for a little square talk on the subject. For his troubles he was rewarded with a film that most of the American population would not get a chance to see until well after his death. The new Criterion disc of White Dog has an excellent transfer in its original aspect ratio of 1.78:1. The colors are well represented but it must be said that this film is a low budget, late seventies film and has a look and feel that is particular to its time and circumstances (I just mention this because I have read some complaints online about how it looks like a made-for-TV movie and I feel that the viewer must keep certain things in perspective when watching a film like this. If you have an inability to see through certain technical limitations and view the film on its own terms, then this might not be the film for you). • A video interview documentary with the producer Jon Davison, Fuller’s widow Christa Lang-Fuller and the films co-writer Curtis Hanson (L.A. Confidential). • An on-screen print interview with the dog trainer Karl Lewis Miller. • A Behind-the-scenes photo gallery. • A booklet containing two essays (one by J. Hoberman and one by Armond White) and a piece written by Fuller with the gimmick being that he is interviewing the dog after the making of the film. Also: a fun little Easter Egg can be found if you go to the interview doc titled “Four-Legged Time Bomb” in the extras and arrow down to Jon Davison’s name.